You can set version level defaults for all parts of your template, which will dynamically populate each time a version set is used with that template. 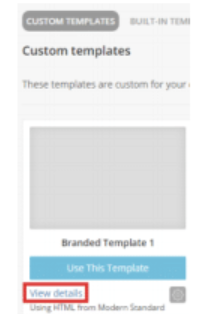 Under the Custom Templates select your template and click view details. 2. Under Field Configuration, select the element you want to change in each version e.g View online text. 3. Check the "Change default when using version sets' box and save. 4. Next, go to the Translated Defaults section and choose a version set from the drop down menu. 5. After selecting your version set, you will see the elements you selected to change i.e View online text. 6. Enter the alternative value for each version under the version name and save changes. 7. When a mailing is created from the template using a version set, the values entered in this section will be populated in each version. 8. You can set different defaults of the same element for different version sets.